Iranian President Hassan Rouhani on Friday said the US and Israel have realized “they will not reach their objectives” by arming Syria’s rebels, as he met with Russian leader Vladimir Putin and Turkish President Recep Tayyip Erdogan for highly-anticipated talks in Tehran to shape the future of Idlib, Syria’s last major rebel bastion. On Thursday Foreign Policy claimed that Israel had armed Syrian rebels for years to advance its interests in the war-torn nation. Rouhani demanded an immediate withdrawal by American forces in the country. The US has some 2,000 troops in Syria. He added that “we have to force the United States to leave,” without elaborating. Rouhani warned against a “scorched earth” policy in Idlib province. “Fighting terrorism in Idlib is an unavoidable part of the mission of restoring peace and stability to Syria,” Rouhani told the summit in Tehran. “But this battle must not cause civilians to suffer or lead to a scorched earth policy,” he added, amid UN warnings of a humanitarian disaster if an offensive goes ahead. The three countries are guarantors of the Astana process, a track of talks on Syria’s civil war launched after Russia’s game-changing 2015 military intervention that has eclipsed Western-backed Geneva negotiations led by the United Nations. Erdogan called for a ceasefire to prevent any “bloodbath” in Idlib as Russian airplanes pounded rebel positions in the Syrian province. “If we can ensure a ceasefire here, this will be one of the most important steps of the summit, it will seriously put civilians at ease,” Erdogan said. “We never want Idlib to turn into a bloodbath,” Erdogan said. Iranian and Russian support for Syrian President Bashar Assad has shored up the Damascus regime, allowing it to regain the upper hand in the seven-year civil war which has claimed some 350,000 lives since 2011. Seized from government forces in 2015, Idlib and adjacent areas form the final major chunk of Syrian territory still under opposition control. It is home to some three million people — around half of them displaced from other parts of the country, according to the United Nations. Putin said it was “unacceptable” to use civilians as a pretext to shield “terrorists” in Syria’s rebel-held Idlib. He warned militants in Idlib planned “provocations,” possibly including chemical weapons. The Syrian government has been repeatedly accused of using chemical weapons in the long conflict. Iran wants to keep its foothold in the Mediterranean nation neighboring Israel and Lebanon. Turkey, which backed opposition forces against Assad, fears a flood of refugees fleeing a military offensive and destabilizing areas it now holds in Syria. And Russia wants to maintain its regional presence to fill the vacuum left by America’s long uncertainty about what it wants in the conflict. Northwestern Idlib province and surrounding areas are home to about 3 million people — nearly half of them civilians displaced from other parts of Syria. That also includes an estimated 10,000 hard-core fighters, including al-Qaeda-linked militants. For Turkey, the stakes couldn’t be higher. Turkey already hosts 3.5 million Syrian refugees and has sealed its borders to newcomers. It has also created zones of control in northern Syria and has several hundred troops deployed at 12 observation posts in Idlib. A government assault creates a nightmare scenario of potentially hundreds of thousands of people, including militants, fleeing toward its border and destabilizing towns and cities in northern Syria under its control. “The least the summit can do is to prevent this military war,” he said. Turkey also doesn’t want to see another Kurdish-controlled area rise along its border, as it already faces in northern Iraq. According to this report, Abbas’s position caused Egypt to place the internal Palestinian reconciliation at the top of its list of priorities and to reject the “calm first” approach. Palestinian Authority President Mahmoud Abbas threatened to sever ties with Israel if the state makes an agreement with Hamas, Palestinian sources told Al Hayat, a London based newspaper on Friday. According to the report, the sources said that Abbas’s position caused Egypt to place the internal Palestinian reconciliation at the top of its list of priorities and to reject the “calm first” option. Abbas said that he had met with Shin Bet director Nadav Argaman in early September. Argaman had tried to persuade Abbas not to sabotage the efforts to arrange a settlement between Israel and Hamas and to ensure a Palestinian reconciliation, according to an Israeli source on Monday. According to the report, Argaman told Abu Mazen that this is a historic opportunity and it would be a shame to waste it. Because of this change in priories, Hamas might be forced to seek alternatives other than direct talks with Israel towards a calm agreement, including possibly reaching a truce with Israel but having PLO delegate Azzam al-Ahmad sign the agreement. The sources also said that Hamas sought calm over Palestinian reconciliation because of the unacceptable conditions imposed by the PA, including handing over responsibility for the Gaza Strip. Hamas has a few other options, but all are difficult for them: disarmament; a total collapse of the social and economic situation in the Gaza Strip; or a popular revolt in Gaza, which will lead to thousands of casualties and war with Israel. Hamas rejected these options and decided that maintaining the status quo of quiet would be the lesser of all evils. The source said that Hamas rejected the conditions of Fatah and referred to them as impracticable. Other factions such as the Islamic Jihad also rejected the conditions. Yvette J. Deane translated this article. Turkish President Tayyip Erdogan warned Turkey can not accept any more refugees, claimed any attack in Idlib would result in a disaster. Syrian and Russian jets struck anti-Assad forces in Idlib on Friday as the leaders of Russia, Iran and Turkey – the three main nations with boots on the ground in the war-torn country – started their summit meeting in Teheran. The conquest of Idlib will allow Syrian leader Bashar Assad to regain full control of the country and the Teheran summit meeting between Turkish President Tayyip Erdogan, Russian President Vladimir Putin and Iranian President Hassan Rouhani is where the future of Syria is currently being discussed. Faced with US demands Iranian forces pull out of Syria Rouhani stated it is the US that should withdraw its forces out of Syria. He made it clear that the operations against anti-Assad forces in Idlib will continue until they all leave Syria. Citing Israel alongside the US the Iranian leader claimed the two countries will not achieve their goals by arming the anti-Assad forces. Erdogan argued his country can not take in any more Syrian refugees and argued that a “rational solution” to the Idlib situation should be reached. Erdogan said it is crucial to maintain Idlib’s current status and argued the US offers support to “terrorist groups” in Syria. US President Donald Trump warned against a wide-scale operation in Idlib tweeting that “hundreds of thousands might die.” Chariman of the Joint Chief of Staff General Joseph Dunford warned against a large scale Assad-forces attack in Idlib as that might lead to a humaniterian disaster. “I think we all want to avoid that”, he said while visiting Athens earlier this week. The visit to the Greek capital suggests the US looks to Greece as a potential partner should it need to use US forces to operate in Syria, reported Newsweek. The Secretary’s Special Representative for Syria Engagement Ambassador Jim Jeffrey stated on Thursday that American forces will remain in Syria until ISIS is defeated and Iranian forces exit the country. He also warned that Assad “has no future as a ruler” in Syria, but it was not up to Washington to get rid of him and it would work with Moscow on a political transition. Trump will chair a U.N. Security Council meeting on Iran during an annual gathering of world leaders in New York later this month. The meeting will focus on Iran’s nuclear program and its meddling in the wars in Syria and Yemen. France has invited the United States, Jordan, Egypt, Saudi Arabia, Germany and Britain for talks on the sidelines of the U.N. meeting to discuss Syria, Jeffrey said. Syria envoy Jim Jeffrey says U.S. is also seeking “enduring defeat” of Islamic State • Syrian regime is preparing chemical weapons ahead of Idlib offensive, he says • Leaders of Turkey, Russia, Iran to meet in Tehran Friday in effort to avert bloodbath. The Trump administration is pledging that the United States will remain in Syria until the “enduring defeat” of the Islamic State group and the withdrawal of Iranian forces, a move that could signal open-ended American involvement in the war-torn country. “We’re no longer pulling out by the end of the year; we’re going to stay in until we have an enduring defeat [of Islamic State],” U.S. special representative for Syria James Jeffrey told journalists in Washington Thursday. The other pillar of U.S. policy is the complete withdrawal of all Iranian-commanded forces from Syrian territory, said Jeffrey, a veteran diplomat who on Aug. 17 was named Secretary of State Mike Pompeo’s special adviser on Syria overseeing talks on a political transition in that country. This “means we’re not in a hurry to pull out [of Syria],” Jeffrey said, but he added that this does not necessarily mean a long-term U.S. military presence in the country. Jeffrey also said there is “lots of evidence” that chemical weapons are being prepared by Syrian government forces in Idlib in northwest Syria, and warned of the risks of an offensive on the country’s last big rebel enclave. “I am very sure that we have very, very good grounds to be making these warnings,” Jeffrey said, speaking to reporters in his first interview on the situation in Syria since his appointment. The White House has warned that the United States and its allies will respond “swiftly and vigorously” if Syrian government forces use chemical weapons in the widely expected offensive. Syrian President Bashar Assad has massed his army and allied forces on the frontlines in the northwest, and Russian planes have joined his bombardment of rebels there, in a prelude to a possible assault. The fate of the insurgent stronghold in and around Idlib province rests on a meeting scheduled on Friday in Tehran between the leaders of Assad’s supporters Russia and Iran, and the rebels’ ally, Turkey. “We will find out to some degree tomorrow [Friday] if the Russians are willing to come to a compromise with the Turks,” Jeffrey said. Backed by Russian air power, Assad has taken back one rebel enclave after another. Idlib and its surroundings are now the only significant area where armed opposition remains. As the sides close in on the remaining jihadist forces operating in Syria, Jeffrey said it was time for a “major diplomatic initiative” to end the seven-year conflict. There is “a new commitment” by the U.S. administration to remain in Syria until Islamic State militants are defeated while ensuring Iran leaves the country, he said. While U.S. President Donald Trump had signaled that he wanted U.S. forces out of Syria, in April he agreed to keep troops there a little longer. Trump will chair a U.N. Security Council meeting on Iran during the annual U.N. General Assembly in New York this month. The meeting will focus on Iran’s nuclear program and its meddling in the wars in Syria and Yemen. France has invited the U.S., Jordan, Egypt, Saudi Arabia, Germany and the U.K. for talks on the sidelines of the U.N. meeting to discuss Syria, Jeffrey said. He said Assad “has no future as a ruler” in Syria, but it is not up to Washington to get rid of him and it will work with Moscow on a political transition. “Right now, [the Syrian government] is a cadaver sitting in rubble with just half the territory of Syria under regime control on a good day,” Jeffrey said. Meanwhile, Syrian Prime Minister Imad Khamis said on Thursday that Idlib will soon be restored to Syrian government control and vowed to win any coming war. “Idlib will soon be restored to the nation,” Khamis said in a speech at the opening ceremony of the 60th annual Damascus International Fair. Last week, a source close to the Syrian government said it was preparing a phased offensive to recover Idlib. But Turkey, which has a string of military observation posts around the edge of the rebel area, has warned against such an assault. The province and surrounding area is home to about 3 million people – nearly half of them civilians displaced from other parts of Syria – but also an estimated 10,000 hard-core fighters, including al-Qaida-linked militants. For Russia and Iran, retaking Idlib is crucial for what they see as a complete victory in Syria’s civil war, given that Syrian troops have recaptured nearly all other major towns and cities and have largely defeated the rebellion against Assad. However, a bloody offensive that creates a massive wave of death and displacement would run counter to their narrative that the situation in Syria is normalizing, and could hurt Russia’s longer-term efforts to encourage the return of refugees and get Western countries to invest in Syria’s postwar reconstruction. Turkish President Recep Tayyip Erdogan stands to lose the most from an assault on Idlib. Turkey already hosts 3.5 million Syrian refugees and has sealed its borders to newcomers. It has also created zones of control in northern Syria and has several hundred troops deployed at 12 observation posts in Idlib. A government assault creates a nightmare scenario of potentially hundreds of thousands of people, including militants, fleeing toward the border and destabilizing towns and cities in northern Syria. “I don’t think that there is a total solution for Syria on the table, but certainly it is a defining moment,” said Sam Heller, a senior analyst at the Brussels-based International Crisis Group. He said that if the Syrian regime retakes Idlib, this would mark a near-total victory over the opposition, but would likely also bring humanitarian suffering and carnage on a scale greater than anything seen so far in the seven-year war. 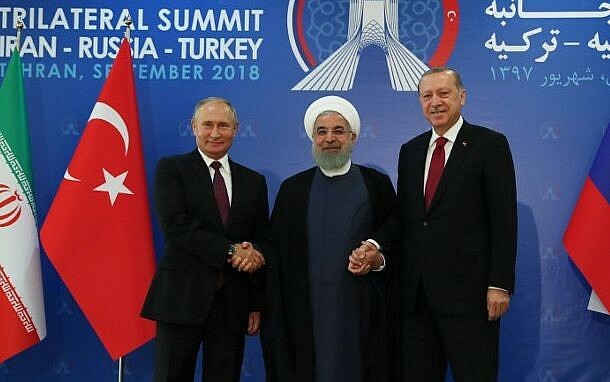 Many expectations hang on the Iran summit, which will bring together Erdogan, Russian President Vladimir Putin and Iranian President Hassan Rouhani. Speaking to Russian news agencies in Moscow on Wednesday, Russian Deputy Foreign Minister Sergei Ryabkov repeated Russian statements that Idlib is turning into a breeding ground for terrorists and needs to be dealt with accordingly. But he said Russia “is acting cautiously, selectively, and is trying to minimize possible risks for civilians.” He said the Russian and U.S. militaries, as well as diplomats, are still in touch on the situation in Idlib. Instead of a full-scale assault, Russia, Turkey and Iran could agree to a piecemeal approach that would see government forces taking off bites of the province, including cities such as Jisr al-Shughour, close to Assad’s coastal heartland in Latakia province, and Maaret al-Numan and Khan Sheikhoun, which lie on the M5, a key highway that runs through Syria’s major cities. As well as “an all-out economic war that is carefully guided by a war room,” Iran is facing “major media and propaganda warfare,” Supreme Leader Ayatollah Ali Khamenei asserts • Campaign aims to “infect” Iranians with “anxiety and pessimism,” he says. Iranian Supreme Leader Ayatollah Ali Khamenei accused the United States and Israel on Thursday of waging a media war to discourage Iranians, state TV reported. The report came as Iran faces economic hardship after the reimposition of U.S. sanctions in the wake of President Donald Trump’s pullout from the 2015 nuclear agreement between Iran and world powers on May 8. The rial currency has lost about two-thirds of its value this year and the cost of living has soared, sparking sporadic demonstrations against profiteering and corruption, with many protesters chanting anti-government slogans. “Today, [Iran’s] Islamic system faces an all-out economic war that is carefully guided by a war room, but along with this war, there is a major media and propaganda warfare that is often neglected,” Khamenei told members of a senior clerical body. Iranian officials have blamed popular messaging apps and social media campaigns, which they say are organized overseas, for the protests that erupted in December and have spread to more than 80 cities and towns. Around 25 people were killed in clashes with regime forces. State TV quoted Khamenei as saying, “The goal of this media war is to create anxiety and pessimism among people towards each other and the authorities and to exaggerate economic problems in the minds of the public. Saudi Arabia, Iran’s main regional rival, and the United Arab Emirates have backed Trump’s decision to reimpose sanctions on Iran, reflecting the wealthy oil exporters’ concerns about Iran’s ballistic missile program and support for militant groups. On Wednesday, Trump told reporters he remained open to the possibility of talks between Washington and Tehran. However, he added, “Iran is in turmoil right now. They’re in total turmoil. Now they are just worrying about their own survival as a country.” He did not offer any evidence.